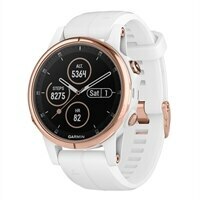 Garmin fenix 5S Plus Sapphire - GPS/GLONASS/Galileo watch - Hiking, Running, Swimming 1.2 inFor athletes and outdoor adventurers, the fenix 5S Plus multisport GPS watch is the rugged, high-performance timepiece that meets big challenges and fits smaller wrists. Beat yesterday with premium features that range from routable TOPO maps and storage for up to 500 songs to estimated heart rate at the wrist and Garmin Pay, the contactless payment solution. fenix is equipped with ABC sensors (altimeter, barometer and compass) to provide explorers relevant real-time information. The built-in altimeter provides elevation data to accurately monitor ascent and descent, the barometer can be used to predict weather changes by showing short-term trends in air pressure and a 3-axis electronic compass keeps the user's bearing whether he's moving or not. Utilizing its GPS receiver, fenix can auto-calibrate its ABC sensors and also auto sets the time based on location. For an extremely accurate temperature reading, fēnix can be paired with tempe, Garmin's new external temperature sensor.